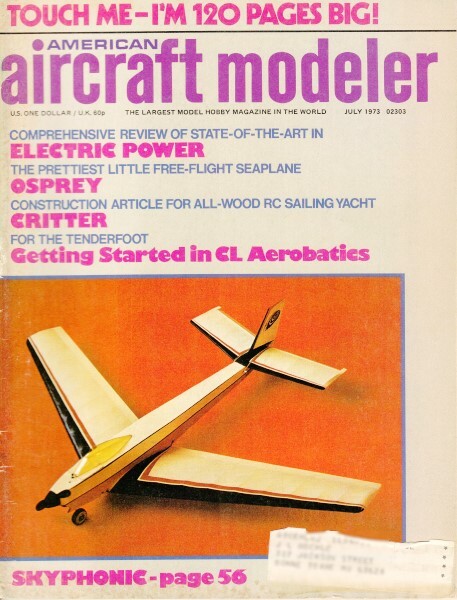 Website visitor Larry J. wrote to ask that I scan and post this article for the "Critter" radio controlled sailboat that appeared in the July 1973 edition of American Aircraft Modeler. Author, designer, draftsman, builder, and sailor Victor F. Miglierina has done an incredible job at documentation. 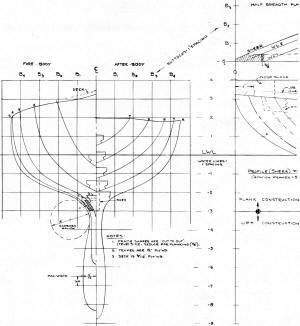 The level of detail in the plans and all the detailed drawings for fittings, sails, ballast molds, etc., are second to none. 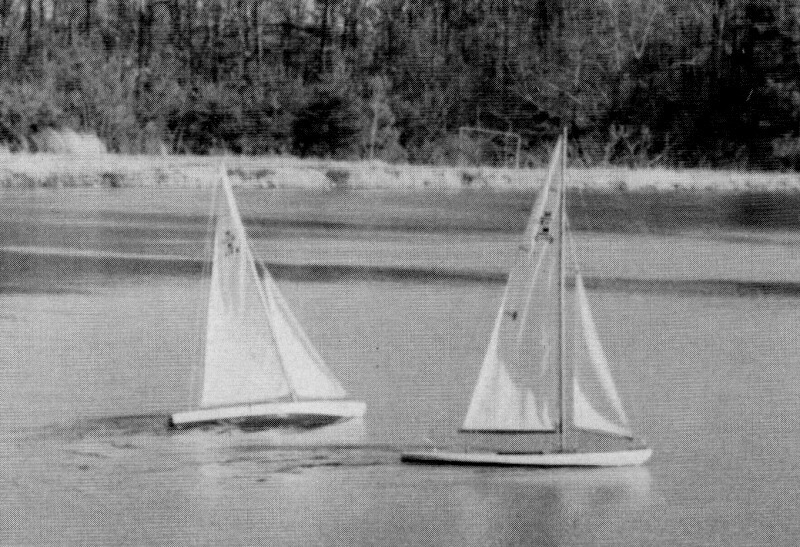 The vast majority of R/C sailboats manufactured today have fiberglass, carbon fiber, or ABS plastic hulls, and go together fairly rapidly. Larry's effort to build from wood is to be commended. I built a Dumas Pride of Pay-n-Pak hydroplane from a wood kit a long time ago and appreciate the effort that goes into it. 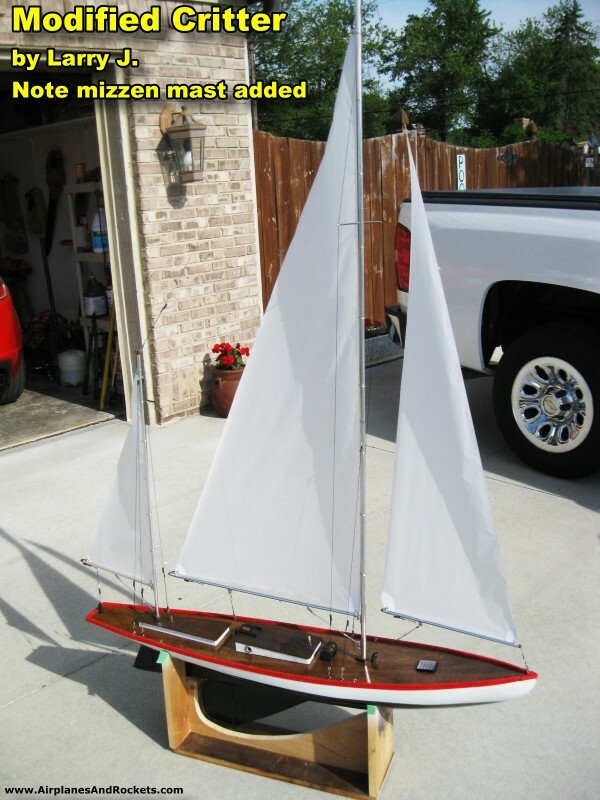 I also built a couple static display wood sailboat kits from Midwest, Muscongus Bay Lobster Smack and Sharpie Schooner. Completing the Critter will take more effort and skill than all my endeavors combined. 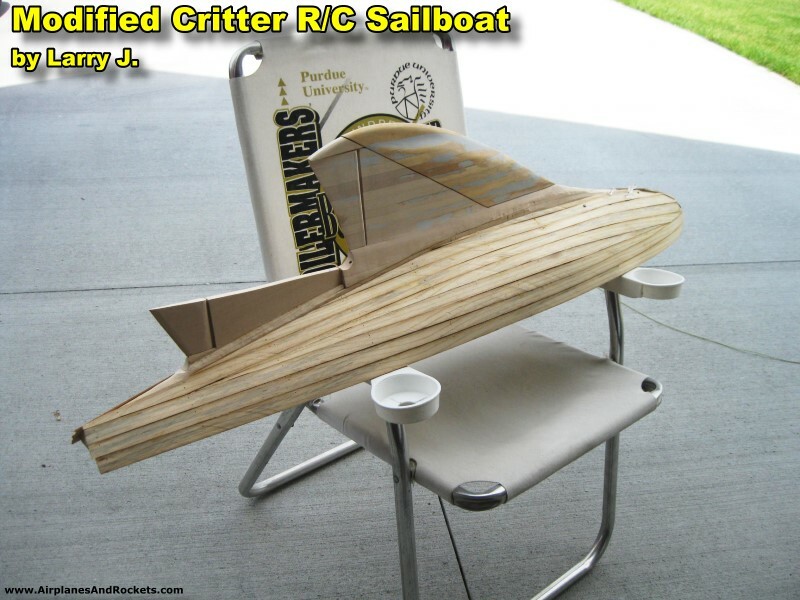 May 31, 2015 Update: Larry J. sent photos of his completed Critter R/C sailboat - amazing craftsmanship on display! 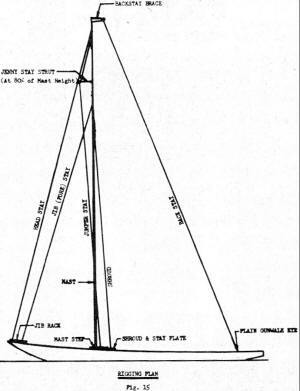 Larry added a mizzen mast (the rear mast) to the original, which was a standard sloop configuration with a mainmast holding the mainsail and jib. He scaled it to a 48" hull length, and it uses a little over 13 pounds of lead ballast. I will ask him for a photo of the radio compartment. 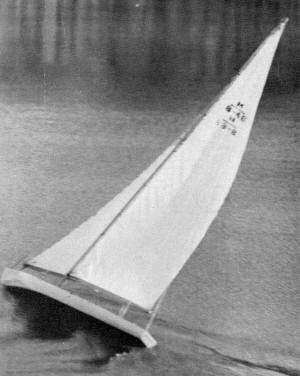 Building and sailing a model racing yacht is a healthy pastime and a challenge to one's imagination, skills and patience. 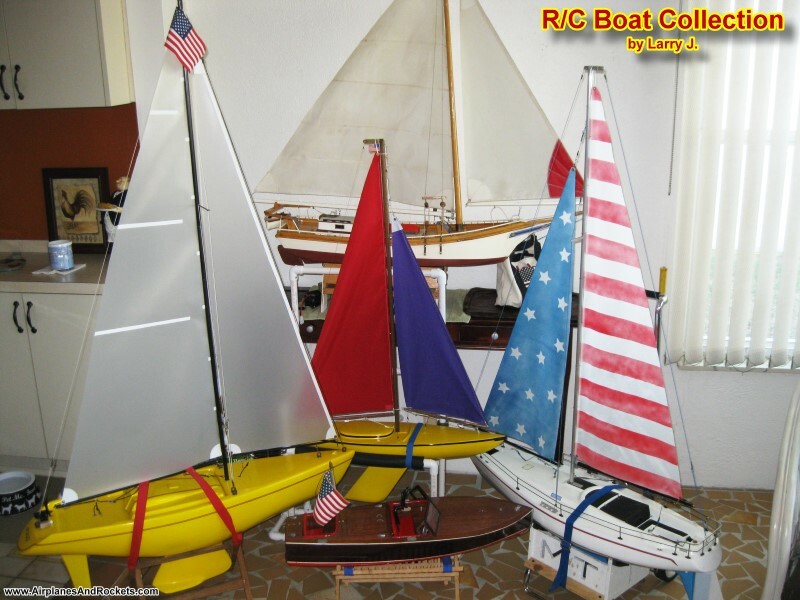 The results will be rewarding - the satisfaction of the many hours of patient craftsmanship it represents, plus the thrill of sailing the model that can be handled like a real yacht, thanks to RC, except for the fact you're not on board. Simplified construction all wood racing yacht in the Marblehead 50-800 Class. It is an easy sailing model even for us RC airplane nuts. The boat is 50 in. long with a beam of nine in. and is planked from the sheer line down to W.L.-3. Below this, the lift or "bread and butter" method is used. 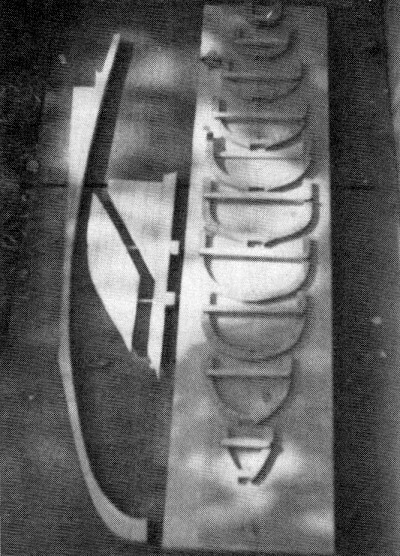 The model is built upside down on a large flat jig board (3/4 x 12 x 52"). Mark off the centerline and frame spacing per plans and attach the cross pieces, equal in length to the breadth of the frames, to the jig board in the proper positions. Trace the frame outlines on 1/2" marine plywood allowing 1/2" thickness for the innerface of the frame and decreasing the outerface by 1/8" to allow for the planking. (See Fig. 1A). The small lips extending past the upper ends of each frame are for proper alignment and are later cut off. (Always reset the sheer and W.L. references on the faces and edges of the frames that are cut away during construction.) Note that the keel, due to its curvature, rests on the forward edge of the notches in the midships and fore body frames and the after edge of the notches in, the after-body frames. All the notches, including the flush fitting frames 3 and 4, must be filed off to permit the backbone to fit across them. Set the frames in place and fasten to the cross pieces with screws. Trace the backbone outline on 1 1/4" thick mahogany or clear white pine, marking all station positions, rabbet line, keel bolt and stuffing box holes and skeg slot location. The "noseblock" at the stem serves to fasten the stem to the jig board and will be cut off later. Cut out and finish the backbone to the correct profile. Locate and drill the keel bolt and stuffing box holes. 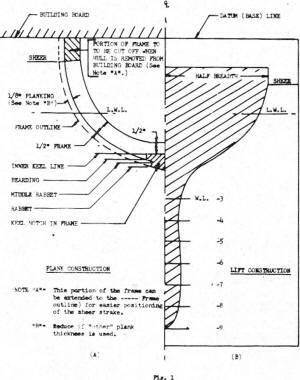 Shape the backbone to the dimensions shown on the half breadth plan and cut the skeg slot 3/16" deep, "dead" on the centerline from station 7 aft. The next phase of construction is that of the keel from W.L.-3 through W.L.-8 using the lift method. In some lifts the upper face of the layer is larger than the lower face then the converse occurs. It is important to remember this point in sawing the layer to shape, as the outline is governed by the larger face. (Though requiring more labor, all lifts may be cut to a uniform width of 1-3/8" with the length determined from the profile.) Trace the outline of each lift to one-in. thick pine keeping the grain running in the same direction. 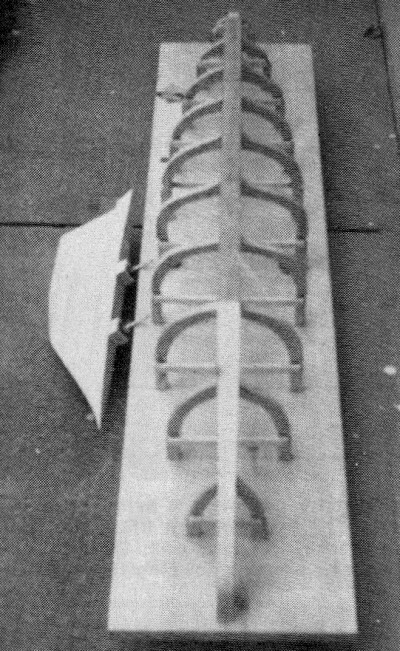 (The forward rudder is part of the keel and will be cut out later.) Cut out the lifts, mark all references and drill required holes. Using the keel bolt holes for aligning, glue and clamp up the lifts. When the glue has hardened, cut the keel to proper profile. The diagonal lead line is cut straight across the beam. Assemble the keel sections to the backbone installing beveled blocks on the innerface of the keel. Next, the keel is fitted to the frames and right across them. When fitted, glue up and secure the frames to the backbone, fastening the stem in position through the nose block (from the underside of the jig board) and with a brass countersink screw through the keel to the fashion piece. At this stage your boat should look like Fig. 2. (2) Each plank should be in one piece from stem to stern. (3) Each plank must fit its neighbor without forcing or strain, butting up to it with an absolutely tight joint. (4) The work must be kept "level" on both sides of the hull. Therefore, the planks must be put on in pairs. (5) Pre-drill all plank holes staggering (fore and aft) the holes so that they do not go through the same frame ply and spliit it. Use two holes per frame, per plank. (6) Use round toothpicks, dipped in waterproof glue, for. fastening the planks to the frames; wire brads may be used provided they are "set" and filled. (7) Keep planks parallel to the W.L. as much as possible. Since each plank has a different shape and curvature, the best method of finding the shape of each plank is by "spiling." Prior to spiling, plank widths are selected and tentatively laid off on the frames. (Generally the sheer strake is made wide enough to take care of the deck line and the balance vary from 1/2" to 3/4".) Fit a piece of planking to the boat across the frames and as nearly parallel to the W.L. as possible. When properly sighted, clamp the batten in place. Sequence of hull construction. Built upside down on a flat board assembly is quick and accurate. When you remove it from the board, and have sanded the hull, the inside must be carefully painted for waterproofing protection. Decking and controls are next. Number and mark the centerline position of each frame on the plank. Set a pair of dividers with their points apart and parallel to the frame centerline at a distance greater than the space between the edge of the spiling batten and the shape to be obtained (sheer strake) and prick off spots from the sheer line on each station. (See Fig. 3A). As each side planking is prepared it must be an even fit all along the lift line where each plank meets the next one. Do both sides at one time to prevent warping the hull. To obtain the bottom edge, take the dividers and measure on each station to spots set out for the top of the next plank. The line is again run in using a batten. The plank is finished to the lines. A duplicate strake is made for the other side of the boat and fitted. When final fitting has been satisfied, the strakes can be glued in place, fastening to the stem and inner transom with two No. 0 x 3/8" F.H. countersink brass screws and with toothpicks or brads at the frames. 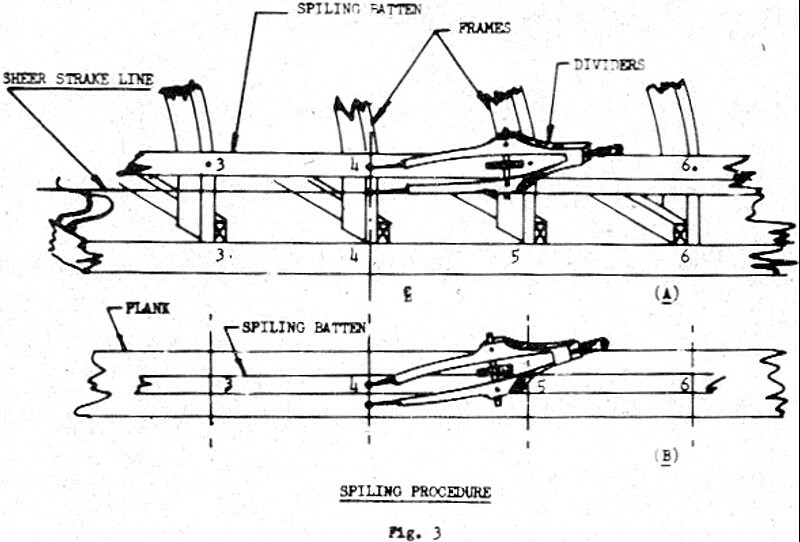 For the second set of planks, the spiling plank is again brought into use; proceed exactly as before except that the measuring point is the lower edge of the sheer strake instead of a row of spots. The lower edge of the plank is obtained in the same manner as for the sheer plank. Cut the planks just outside the marked lines, fit them to the boat, to the lower edge of the sheer strake and extend the rabbet. When satisfactorily fitted, glue, pin and screw in position in the same manner as the sheer plank except that the edges are also glued to the sheer strake. When planking is complete the keel is beveled to the centerline. 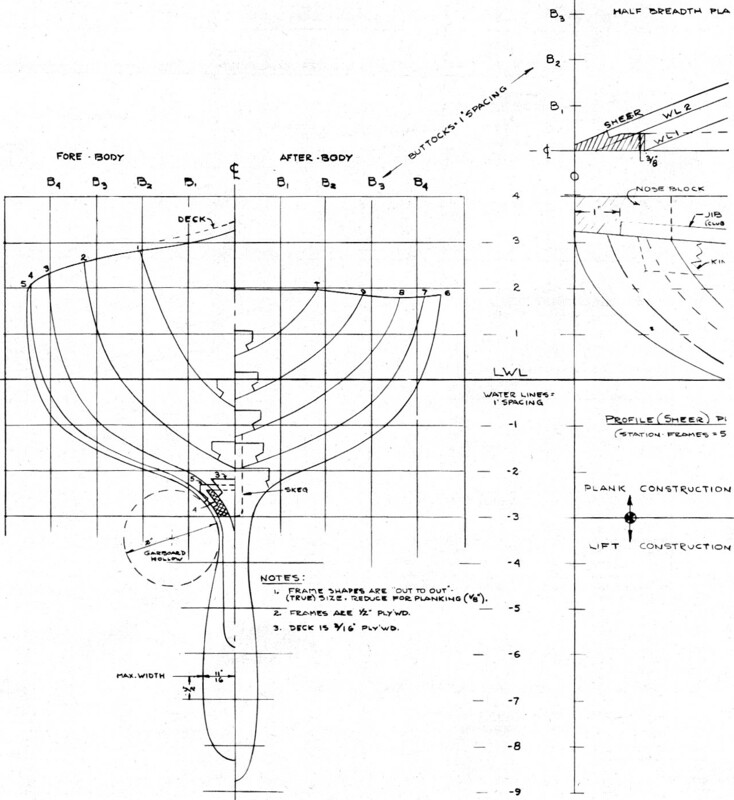 The lift sections of the keel are shaped using templates of stations 3-5 (See Fig. 1B). Start by removing the corners of the lifts at the stations and fairing in between until all the waste is removed. When contours are satisfied, sand to a smooth finish fairing into the planked section of the hull. With the interior varnished for waterproofing the hull is ready for internal fittings and then the deck. 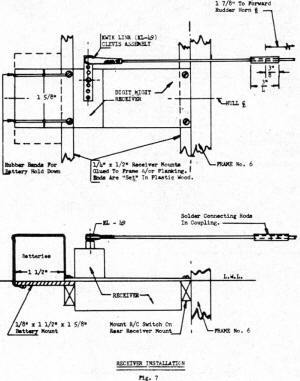 Note mounting holes for the lead keel and carrying handle. The fin is made, fitted and glued to the backbone. Next, the rudders may be cut out, the leading edges shaped and fitted with rudder posts. (There must be no movement between the posts and rudder.) Make, fit and glue the outer transom to the fashion piece. Single-control sailing generally means a pre-set main and jib sheet with steering control by RC only. 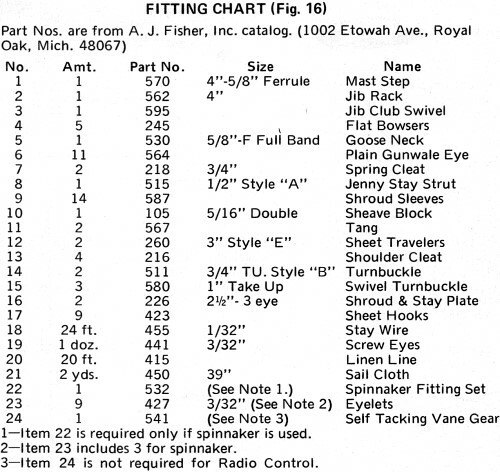 Your sheet setting is a compromise for all "points" of sailing. Critter is a lively and swift moving yacht, so the sheets are kept fairly close in except in very windy conditions. 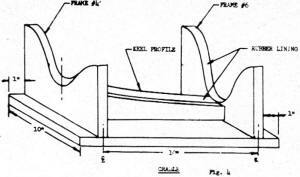 Set the hull aside and make a cradle as shown in Fig. 4. 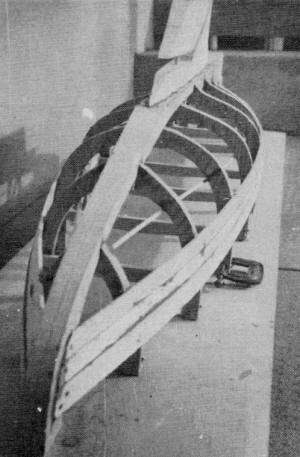 Remove the hull from the building board; set in the cradle and cut off the stem nose block and frame lips to conform to the sheer line and deck curvature. 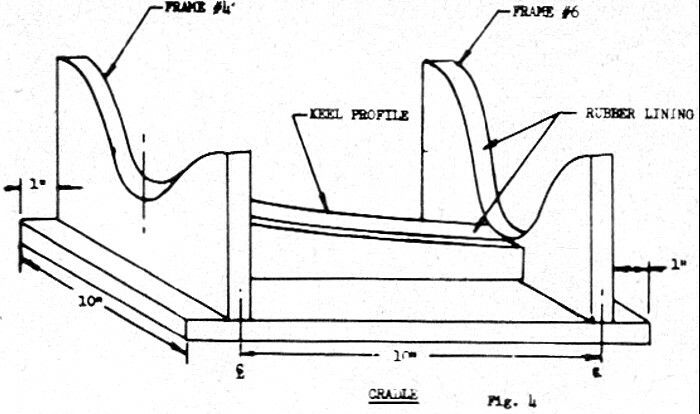 The keel is formed from 15 lb. of lead poured into a greased (Vaseline) plaster mold fitted with the keel bolts. The split mold (be sure to allow for a right and left mold) is made as shown in Fig. 5; filled with molding plaster and "formed" using the prefinished and waxed ballast pattern removed from the hull. Note that the mold is split at the centerline of the ballast and this line is used as the plaster leveling line. Bake the plaster molds at 375° for three hours. Assemble with tape, set the keel bolts and pour in molten lead-leveled off at W.L.-4. Cut off excess bolts at bottom of keel, smooth out any irregularities, fill voids with auto body filler and "true" up the top edge (W.L.-4) to insure proper fit with the hull via the brass plate. Shape, fit and fasten the brass plate to the hull. Assemble the ballast to the hull installing the handle, washers and wing nuts accordingly. Make, fit and install the forward rudder post guide. Part of her character is the twin rudder arrangement. Note that the keel has a rudder which is linked with the aft rudder. Numbers stitched on the sail indicate racing class and the. owner's number. The model is registered in AMYA (American Model Yachting Assoc., 4761 Niagara Ave., San Diego, Calif. 92107). The hull should now be given a final check for smoothness, open seams, tool marks, dents, low spots, etc. Fill and smooth where necessary and sand to a glassy surface. Apply successive coats of sealer, pure shellac and two of under-coater, sanding between coats with 180 W-D paper. To support and properly crown the deck, a King plank and deck beams must be installed and the hatch framed as shown in Figs. 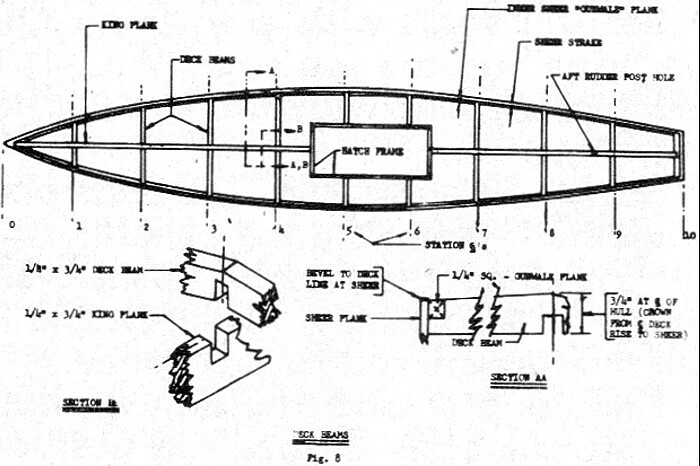 8 & 9 and the hull plans. Gunwales must be installed between the deckbeams in positions occupied by the cross pieces and all beveled to proper crown. The inside of the hull should now be varnished with three coats of spar varnish rubbed well into the seams and the first coat cut 50% with turpentine permitting good penetration. Do not varnish the top of members to receive the deck or permit spillage on the controls. A birch deck is fit, cut and "planked" as shown in Fig. 10. The underside is given one coat of sealer and under-coater between the areas to receive glue and the top side finished with two coats of varnish, the first being thinned 50%. Glue and fasten the deck to the hull with 1/2" No. 18 "set" brads or 3/8" No. 1 F.H. countersink brass screws. Sand the edges even with the hull. 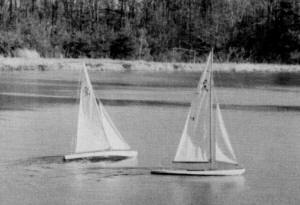 The two models above are tacking to starboard, however, the boat to the right is pointed so directly into the wind, it is not moving as swiftly as its companion. The hull and deck are ready for their final finishes which is left to the builder. If a multi-colored hull is desired, the W.L. may be established by placing the hull in a tub of water, the surface of which has been sprinkled with talcum powder, and allowed to float free. When finished apply auto wax to the hull and deck and polish to a shine. 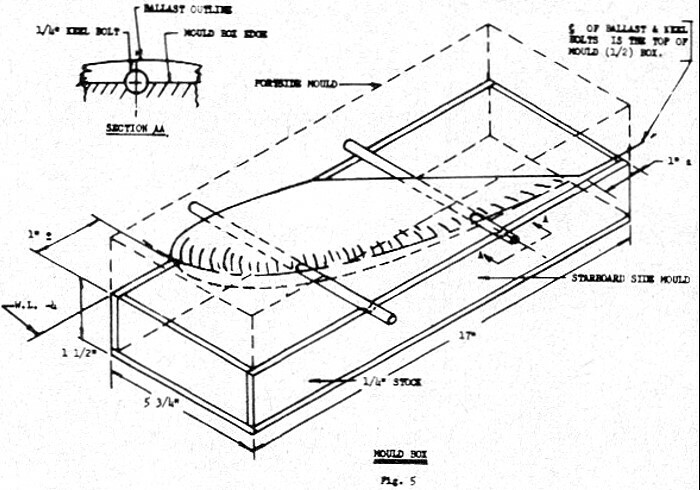 The main hatch is made as shown in Fig. 9 and finished similar to the deck. 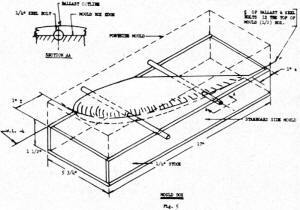 The lube hatch is made from a "pill" box as noted on plan. A maple mast with straight after edge is made as described in Fig. 11 and fitted with the Ferrule and pin. The backstay brace (Fig. 12) is made and fastened to the top of the mast and the mast finally finished with two coats of shellac and one coat of spar varnish. 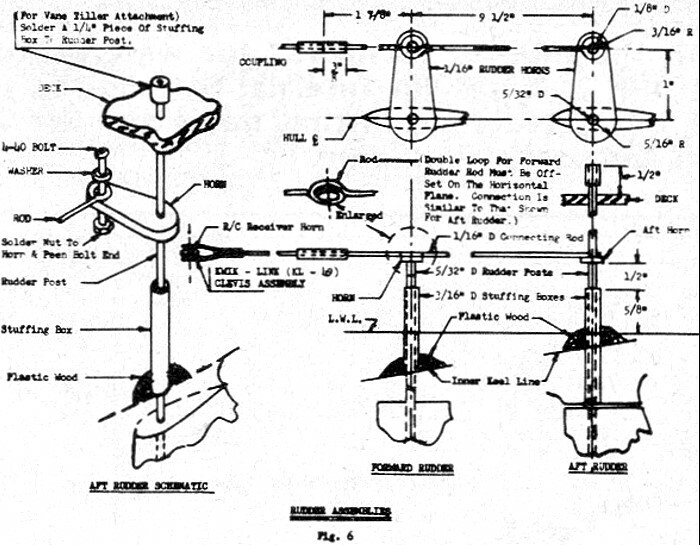 The main and jib booms, Fig. 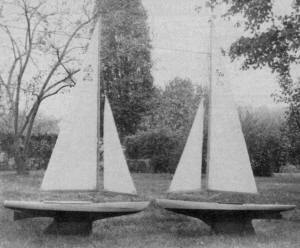 13 are made as described and finished in similar manner as the mast. 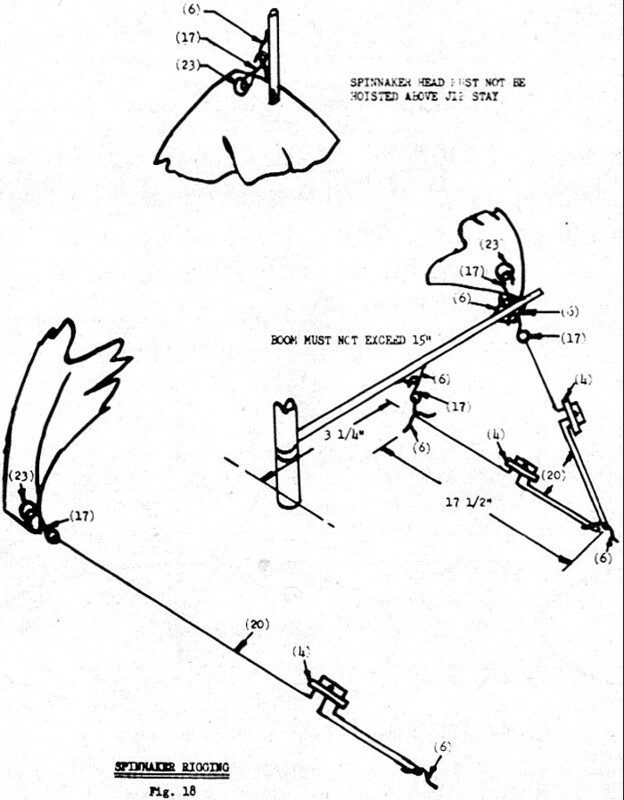 Attach the goose neck and jib club swivel, respectively to the forward edges. Refer to Fig. 14 for the sail nomenclature. For the mainsail, draw the chords between the head, tack and clew. Divide the leech chord in half and measure out two in. for the roach. Sweep a fair curve from the clew to the head, allowing a slight more curve at the top half of the leech. Layout the four four-in. batten pockets perpendicular to the leech chord by dividing it into five equal parts. Tablings are made from 1" iron-on tape and headboards from 1/32" plastic. Tablings are sewed with two rows of stitches, corners reinforced with triangular patches of tape and battens of 1/16" plastic are slipped into the pockets. Sew No. 90 dress hooks on the luff and foot of the mainsail spacing them 3" and 2" o.c. respectively (Fig. 11, 12, 13), alternating the hooks on either side of the sail. Eyelets will be installed and crimped during rigging. The jib is made in similar fashion using a 1" roach and three two-in. battens with the hooks spaced two-in. o.c. on the luff (Fig. 13B). (1) Unhook the backstay sheet hook from the backstay brace by slacking the bowsers. (2) Unhook the kicking strap from the gunwale eye on mast by slacking the bowser. (3) Unlock antenna snap swivel from antenna loop. (4) Unhook the jacklinesheet hook from the aft traveler by slacking bowser. (5) Uncouple the jumperstay turnbuckles from the tangs. Note: Run up the turnbuckles when uncoupled to prevent their loss. (6) Uncouple the swivel turnbuckle from the shrouds at the stayplate. (7) Slacken the head stay swivel turnbuckle in at the jib rack. Slip head loop out of screw eye, located immediately below the backstay brace, and pass head loop over and out of the backstay brace. (8) Unship the mast from the mast step. (1) Untie the jib forestay and halyard from the spring cleats and slip through the sheave. (2) Unhook the jackline sheethook from the forward traveler by slacking the bowser. (3) Disengage the jib club swivel from the jib rack. It's a lot easier to sail a boat than try to talk or write about it. Experience is the best teacher and all must recognize that there is but one power - the wind. First you must be aware of the "telltale," the angle of apparent wind, which is the difference between the true wind and the forward speed of the boat. This is the wind effect you sail with, and it is by keeping the head of the sail as parallel as possible to the telltale that you get the maximum drive from the sail body. A telltale can be made from silk ribbon 1/2 x 4" secured to a pin pressed into the top of the mast. The sail, because it's like an airplane wing, derives its greatest force on the leeward side. Subsequent actions and reactions of the sails and hull would entail a lengthy discussion. 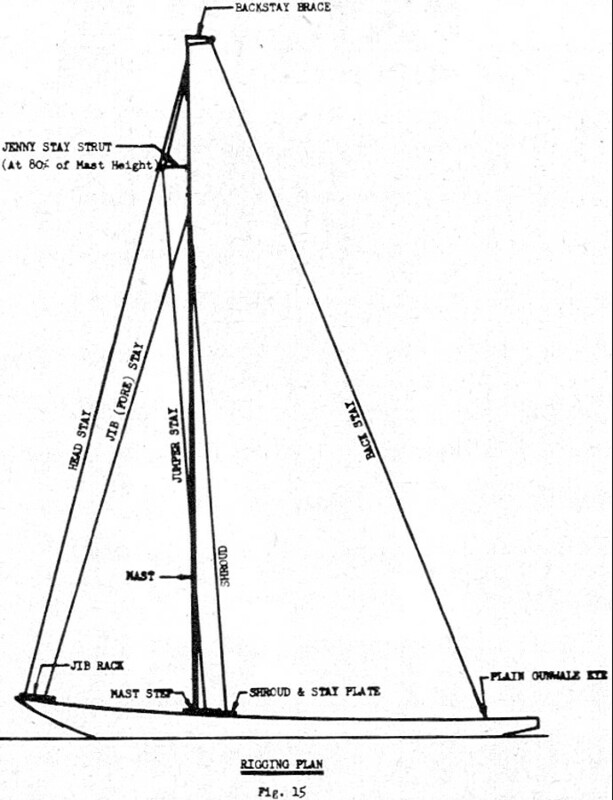 However, the problem at hand is finding the correct position of the mast covering the maximum sailing range and trimming the sails accordingly or raking the mast. If the sail plan is too far forward, the yacht will not point up to the wind. If too far aft, the boat will go into irons. 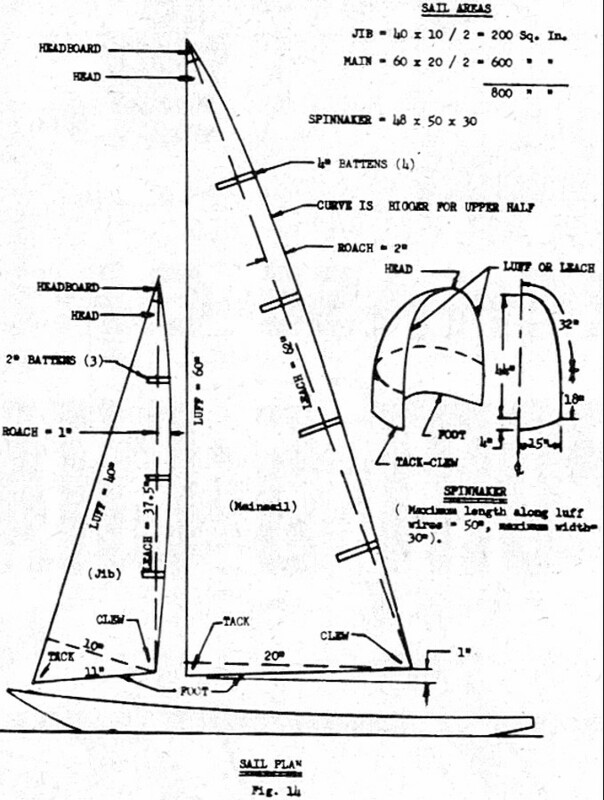 These conditions can be controlled by moving the entire sail plan forward or aft by the slots in the mast step. 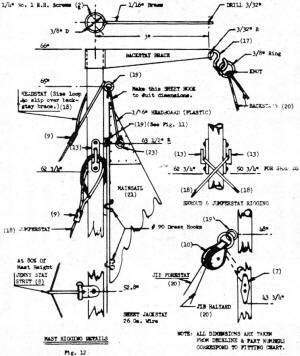 The principal function of the jib, besides furnishing additional drive, is to guide the flow of air around the leeward side of the mainsail. It should not under any circumstances, backwind the mainsail. If it does, either trim the main closer or slack off the jib, if the point of sailing will permit it. If the boat comes into the wind, the jib shaking first, trimming the head sail may correct this condition and keep the boats head off, permitting her to sail a steady course. If the mainsail shakes first, then the jib, shift the rig forward. 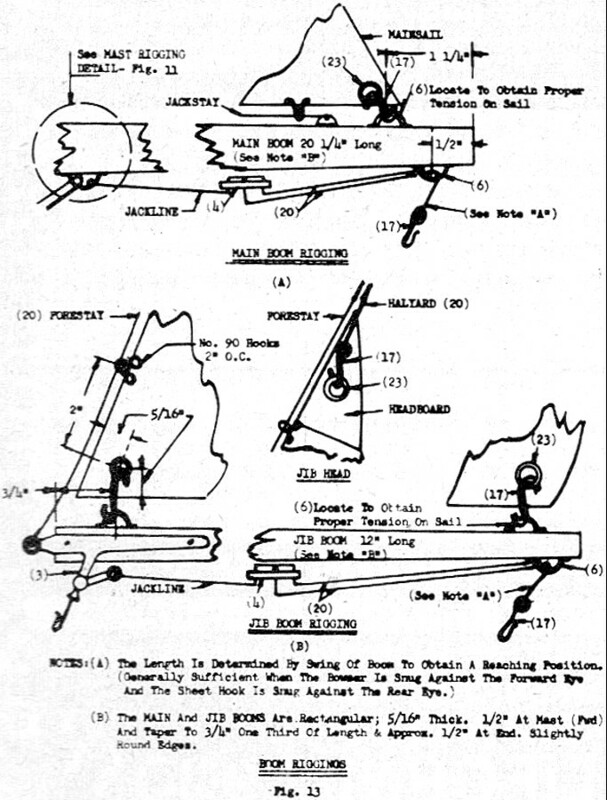 The following figure illustrates some positions of sailing a boat in relation to the wind. Visualize the angle that each sail makes with the wind when the craft is close hauled on the port or starboard tack, reaching and running. When running or broad reaching, the jib, blanketed by the mainsail, has little drawing force. Hence, the use of the spinnaker. Tacking is simply sailing a zigzag course, due to the fact that you cannot sail directly into the wind, by making headway, first on the starboard tack, coming about, then making headway on the port tack. Spinnaker is hooked up as shown in Fig. 18. Get to know your boat, the adjustments required and how much control is to be applied to make her go where you want her to. Above all, keep the gear moving freely and batteries charged. Happy sailing! 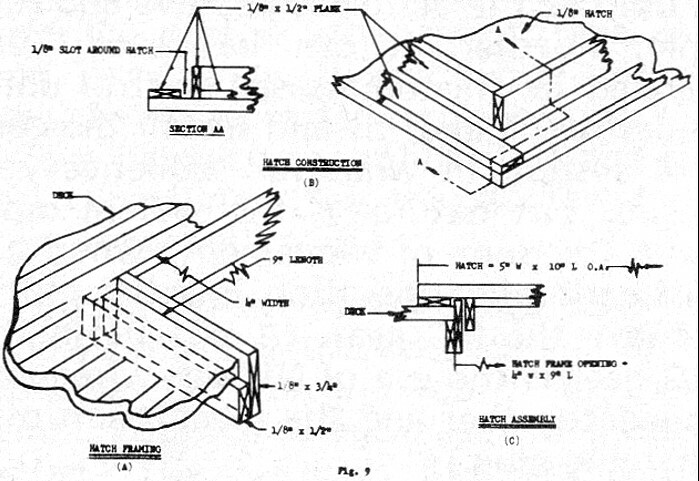 For your convenience, an abbreviated Glossary of Nautical Construction Terminology begins below . 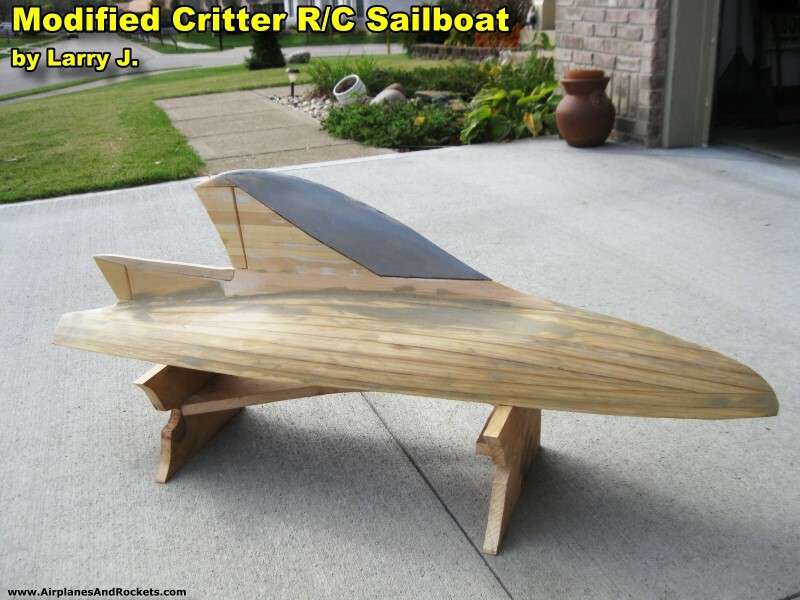 This is not a complete nautical glossary, but rather a list of terms, words and expressions needed to understand and follow instructions for the construction of "Critter." Abeam - At right angles to the line of the keel. Aft (Abaft) (After) - At or toward the stern. Amidship - The center of a ship either midway from bow to stern or in­board (thwartships) from her sides. Apparent Wind - The difference between the true wind and the forward speed of the boat. Astern - A relative term meaning behind. Backbone - The lowest permanent part of a vessel (see Keel). Backstays - Ropes or wires from the masthead slanting aft and out to the hull to help support the mast. (stays requiring adjustment with each change of tack are known as running backstays: while ones leading directly to the stern are known as permanent backstays). Ballast - Dead weight carried low inside a boat to increase its stability by lowering the center of gravity. Lead and iron keels are termed outside ballast. Battens - Thin wooden or plastic strips, fitted into a batten pocket, used to keep the trailing edge of the sail stiff. Beam - The greatest breadth, or width, of a vessel; also a structural member on which the deck is laid. Beat - A course by which the boat sails to windward. Beating is sailing to windward by a zig-zag course. The term beating to leeward is used when a boat sails down the wind in a series of zig-zags known as jibes (see Jibe). Bearding Line - The after side of the rabbet formed by the meeting of the inner faces of the planks and the side face of the backbone (see Rabbet). Bend - To fasten in place. To "bend a sail" is to make it fast to a spar. 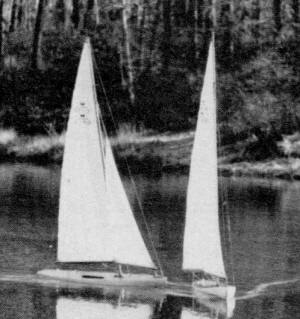 Bermuda Rig - A fore and aft rig with a triangular sail and a mast with an extreme rake. Bilge - The turn of the hull below the water line; also that part inside the hull where water collects above or near the keel. Block - A pulley with one or more rollers (sheaves). Boom - A spar at the foot of a sail; also a pole used to hold spinnakers outboard. Bow - The forward part of a vessel. Bowline Knot - A knot forming a nonslip noose. 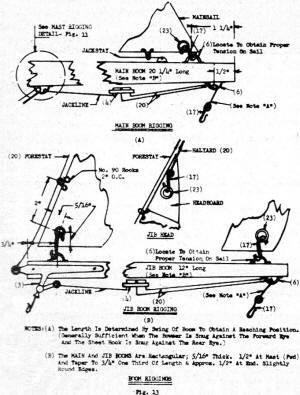 Bowser - A device used for adjusting the ropes on a model yacht. Bowsprit - A boom or spar which projects over the stem of a vessel to carry sail forward. Bread and Butter - A system of lift construction (see Lift). Buoyancy - The ability of a vessel to float. Buttock Lines - Outlines of a number of equally spaced longitudinal sections taken through the hull vertically and parallel to the centerline of the hull. Center of Gravity (C.G .) - The point about which all parts of a vessel balance each other. Center of Lateral Resistance (C.L.R.) - The point at which the boat, when afloat and pushed sideways, will move evenly sideways. It is the C.G. of the underwater profile of the boat. Chainplates - (Shroud and or stay plates) - Plates used to fasten the lower ends of the shrouds. Cleat - A "horned" fitting around which ropes are made secure. Clew - The lower aft corner of any sail. Club - A short spar at the foot of a sail, especially a jib. Close Hauled - Sailing as close to the wind as possible with sails trimmed for beating to windward. Deck - The floor of a vessel. Deck Beams - Beams across the width of the boat supporting the deck. Diagonal - Sloping straight lines across the sections in the body plan, meeting and crossing in the centerline of the plan. They indicate the shape in an inclined plane and are valuable in shaping the boat. Downhaul - A rope or tackle by which a sail is pulled downward. Draft - The depth of water needed to float a boat. Ease - To relieve pressure on a sailor helm (steering system). Eyelets - Ringlets in sails to receive lacings. Fairing - To develop curves around which a plank or batten can be bent without breaking or having humps and waves. Fairlead - An eye or fitting which changes the direction of a rope led through it. Fin - A thin projection from the under­body for the purpose of steadying and stability. Foot - Lower edge of a sail. Frames - Ribs to which planks are attached. Freeboard - Vertical distance from the water line to deck. Garboard (strake) - Plank nearest to keel. 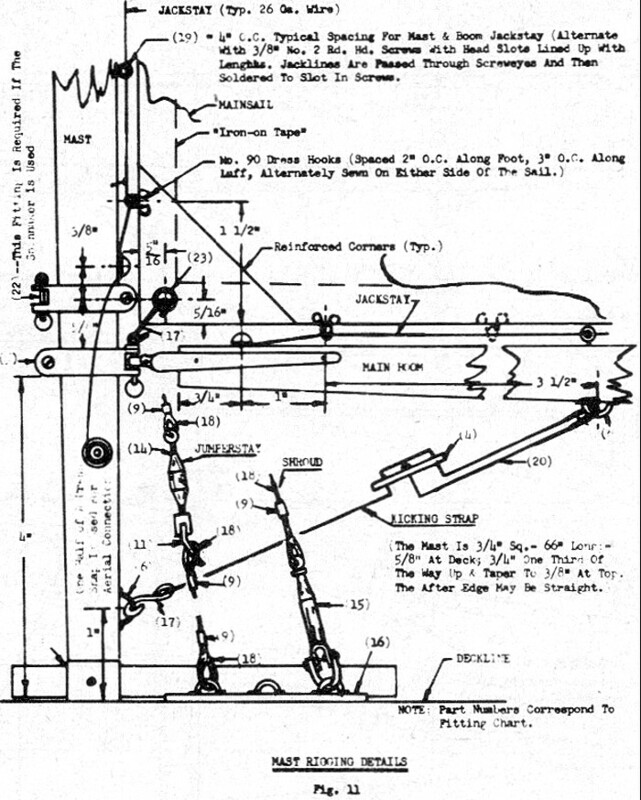 Gooseneck- A hinge or fitting, normally a universal joint, attaching the boom to the mast. Gunwale - A timber around the upper, top side, of a boat. Guy - A rope or wire used to steady or support. 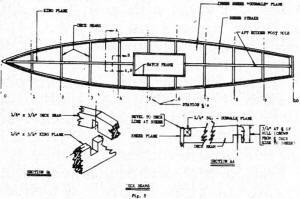 Half-Body Plan - A view showing the transverse or cross sections of one half (forebody and afterbody from the midships section) the hull taken at selected points or stations. Half-Breadth Plan - A view or elevation showing one half the hull as seen from above. Halyard - A rope or wire used to hoist sails. Head - Upper corner of a sail. Headboard - A wooden, metal or plastic fitting at the head of the sail. Head To Wind - With bow headed into wind and sails shaking. Headway - Forward motion of a boat. Heel - The tilt, tip or laying over of a boat, usually due to wind. Helm - Tiller or wheel used to steer a boat. Hull - The main body of a boat exclusive of masts, spars, sails and rigging. In Stays or In Irons - When head to wind while tacking. When a vessel re­mains "in stays" unduly long with no forward motion she is "in irons." Jackline - The line fitted under the boom to receive the bowsers that adjust the sheets. Jackstay - A wire running along the spar to which the sail is hooked in lieu of lacing it around the spar. 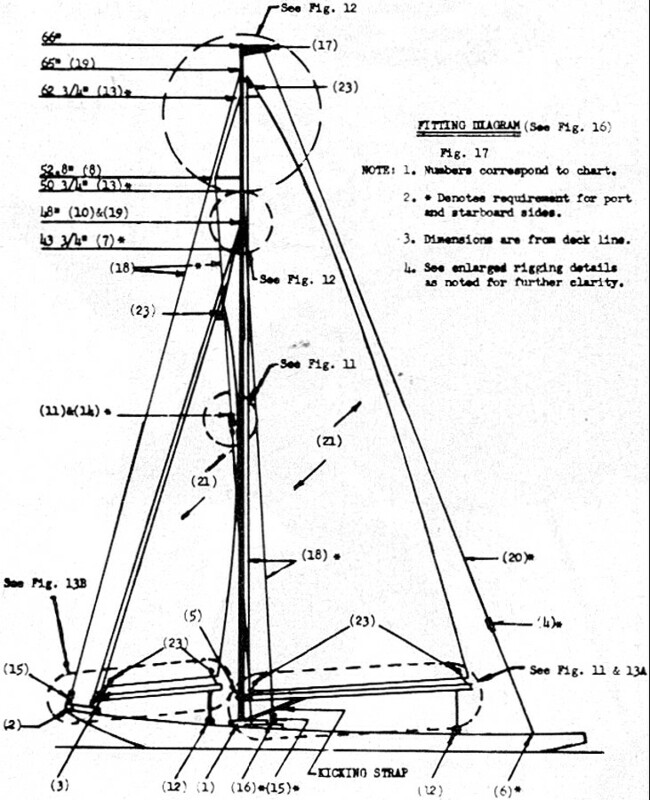 Jib - A triangular sail set forward of the foremast. Jib Club (swivel) - A fitting used on the fore end of a jib boom. Jibe (Gybe) - To change tacks by turning away from the wind with the boom shifting from one side to the other. 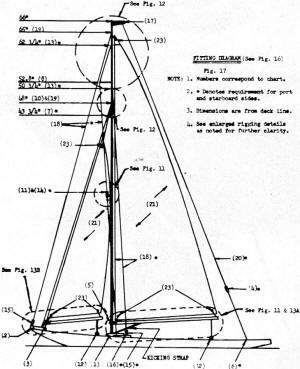 Jib-Head & Jib-Headed - A tall rig with triangular mainsail. Often called a Marconi or Bermuda rig. Jib Rack - A fitting mounted on the bow of the vessel to receive the jib club & swivel. 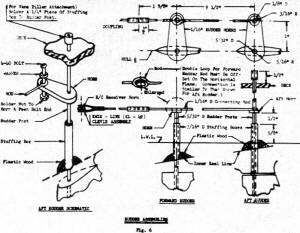 Jib Stay - The forward stay on which the jib is hoisted. Jenny (Jumper) Stay - A single or forked strut placed aloft on the forward side of a mast for added support. Keel - The lowest permanent and main member (backbone) of the hull running fore and aft to which are fastened the stem, stern post and frames. In keel boats it extends below the rest of the hull. I n centerboard boats, it is the central timber through which the board is lowered. 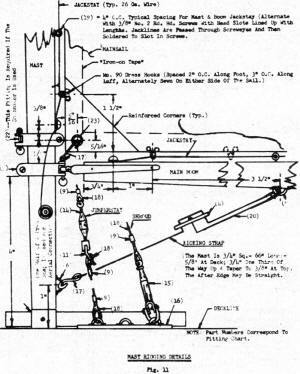 Kicking Strap - Fittings, cable or line attached to the mast and boom which keeps the leach taut during a jibe in addition to holding the boom down when it swings. King Plank - Center plank of the .deck. Knot - Tying or sewing of a rope. Also a measure of speed. One knot = one nautical mph. Leach (Leech) - The aft edge of any sail. Lee or Leeward - The side away from the wind, hence lee side and to leeward. Leeward helm, an unbalanced condition which turns the bow of the boat away from the wind. Lift - Horizontal sections through the hull which give the shape of the water lines. Lines-A general term for light ropes and for any running rigging. 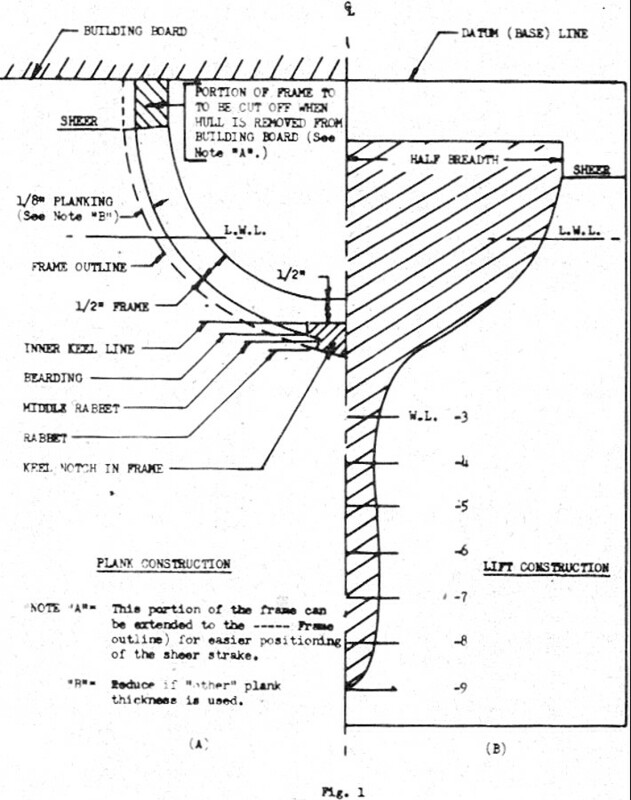 Load Water Line - The plane of floatation of the hull at its designed displacement. Luff - The forward edge of a fore and aft sail. Also the shaking of a sail when a boat points too high for her trim (much like stalling as in an airplane wing). Mainmast - The principal mast of a vessel. Mainboom - Boom at the foot of the mainsail. 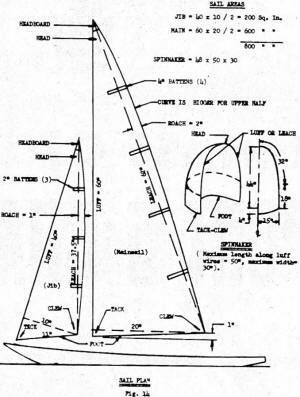 Mainsail - The triangular, fore and aft sail set on the aft side of a mainmast. Mast - A vertical spar supporting sails and rigging. 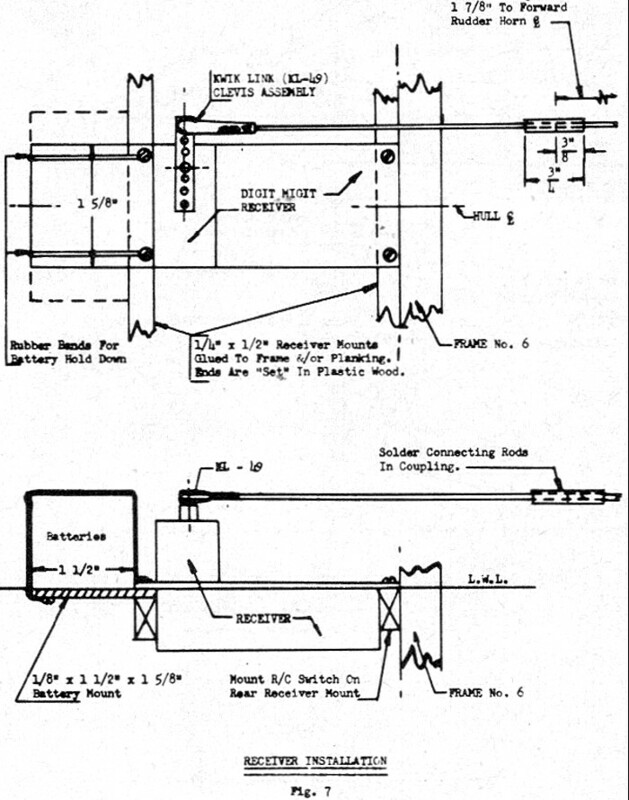 Mast Step - A slotted "T" fitting permitting fore and aft positioning of the mast. Off The Wind - Sailing on any course except to windward. On The Wind - Close hauled. Outboard - Beyond the boat's side or hull. Outhaul - A line used to secure the clew of a sail. Pay Off, Pay Out - A boat pays off when her bow turns away from the wind. Payout is to slacken. Pennant - A small narrow flag. Pinch - To sail a boat so close to the wind that her sails shake or her progress slows. Point, Pointing - To head high, close to the wind. Port - The left side of a boat when facing forward'. Port Tack - When the wind blows over the port side. Profile or Sheer Plan - A view of the hull broadside on. Quarter - The part of the boats side aft of abeam and forward of the stem. Rabbet - A notch in the backbone into which the plank is fitted. Rake - The inclination of a mast from the vertical. Reach, Reaching - All sailing courses between close hauled and running. Close reach, sailing nearly close hauled sheets just eased. Beam reaching, sailing with the wind abeam. Broad reach, sailing with the wind abaft the beam and with the sails well out on the quarter. Rig - The distinctive shape, number and arrangement of sails and masts. Rigging - The wires and ropes of a boat. 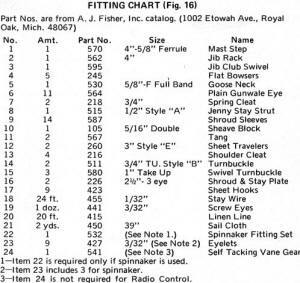 Running rigging sets or trims sails. Standard rigging is permanently secured rigging. Roach - The outward curve of the leach of a sail. Running - To sail almost directly before the wind. Secure - To make fast. Sheave - The wheel in a block. Sheer - The curve of the deck between bow and stem (sheer line). Sheet - Rope controlling the trim of a sail. Skeg - An extension or protrusion of the keel aft, usually to aid steering. Spar- General "term for masts and booms to support sails and rigging. Spinnaker - A light, balloon or parachute shaped sail used when running and reaching. It is held out from the mast by a spinnaker pole or boom. Starboard - The right side of a boat when facing forward. Starboard Tack - When the wind blows over the starboard side. Stays - Ropes or wires supporting masts. Stayplate - Deck fitting to which stays are secured. Stem - The foremost timber at the bow of a boat. Stealer plank - A short plank used to fill in a gap due to errors in spacing strakes. 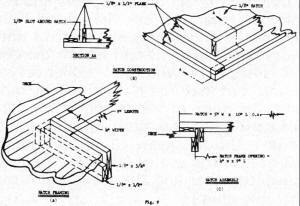 Spiling - A method used to determine the shape of planks. Stern - The aft end of a boat. Strake - Any plank on the side or bottom of a hull. 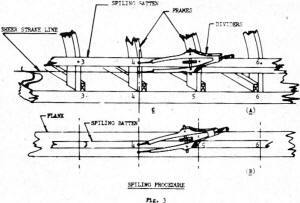 Stuffing Box - A tube (watertight) through which the rudder post is passed (also for propellers). Tack - The forward lower corner of a fore and aft or triangular sail. Tacking - Sailing to windward in zig-zags. Tang - A wire or rope used to steady a spar or boom. Tiller - A bar or rod fitted to the top of the rudder or rudder post used to steer boats. Traveller- Metal rod on which sheet blocks slide athwartships for trimming purpose. Trim - To set sails correctly in relation to the wind. The fore and aft balance of a boat. Tumblehome - The inward curve of the upper sides of a hull. Tuning - The adjustment of a boat's rigging, sails and hull to the proper balance to obtain optimum sailing performance. Turnbuckle - A threaded link which pulls two eyes together for setting, up standard rigging. Wake - Foamy disturbed water astern of a moving boat. Water Line - A longitudinal line, parallel, in profile, to the load water line which shows the shape of the hull in the half-breadth plan. Windward - Toward the wind, hence the weather side of a boat and to windward. Windward (weather) helm is one which tends to turn the boat's bow toward the wind. Yacht - Any pleasure craft. Yaw - The side to side swinging of a boat.